Geneva Middle School mural created as part of a curriculum project on local history. For the past year and a half the Geneva Historical Society has been part of a collaborative project to develop a social studies curriculum focused on the experience of Geneva’s diverse citizens. The impetus for this project emerged following a Community Conversation we hosted in March of 2016 on the issue of race and civil rights in Geneva’s past. Community members at the event discussed their experiences of racism and civil rights activity in Geneva and voiced concern that students were not learning about local struggles for equal rights at school. Geneva has a rich human rights history that includes not only stories about abolitionism and civil rights organizing, but also woman suffrage, labor action, and immigration. Though some of these local stories are included in elementary level field trips to our sites, they are not a regular part of the school social studies curriculum. At the Historical Society we were also looking for ways to help students learn how to critically examine their community’s past and to understand its impact on the present. At the same time, the Geneva City School District was adopting new rigorous Common Core standards for student achievement in reading, writing and the social studies. All of these factors motivated our connection with Elizabeth Belanger, Assistant Professor of American Studies at Hobart and William Smith Colleges and Director of the People’s History of Geneva oral history project, and Karen Fahy, Director of Humanities for the Geneva City School District, to see how we could address these issues. 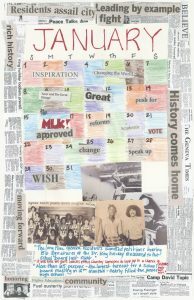 Thus was born the People’s History of Geneva K-12 Curriculum Project. The goal of the project is to create a curriculum that reflects the diversity of experiences in Geneva, a curriculum in which all students see people like themselves as active historical agents. Middle School students work with a Hobart student to assemble their mural panel. Mural panel focusing on timeline of boycott action. 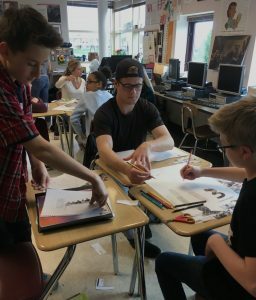 The workshop experience resulted in two projects during the 2016-2017 school year. In the fall, students in Professor Belanger’s Community Based Research class collected material on several local topics for use with the multi-age Infinity program at North Street School. In the process we learned a lot about the challenges of researching local history in the classroom. This project is slated to continue this fall with the students learning to research these topics. This past spring, Belanger’s Art, Memory and the Power of Place class worked with Mary Wagner’s eighth graders to investigate student activism by researching a civil rights action at Geneva High School in the early 1970s. The final project of the middle school students’ research was a mural that is currently on display at the Geneva Historical Society. From 1972-1976 African-American students at Geneva High School walked out of school on Martin Luther King Jr’s birthday to protest the school district’s refusal to recognize the day as a holiday (Martin Luther King Day was not made a federal holiday until 1984). Working with the HWS students, Ms. Wagner’s class analyzed primary source documents about the boycotts and spoke with Patti Blue, who was a student at the time and participated in the walkout. Through this study, the eighth graders considered how students, teachers, and community members have fought for their vision of what a school should be. They made connections between their experiences as students in Geneva’s schools and the experience of other students in the past and considered how issues of power and privilege have shaped students’ experiences over the years. 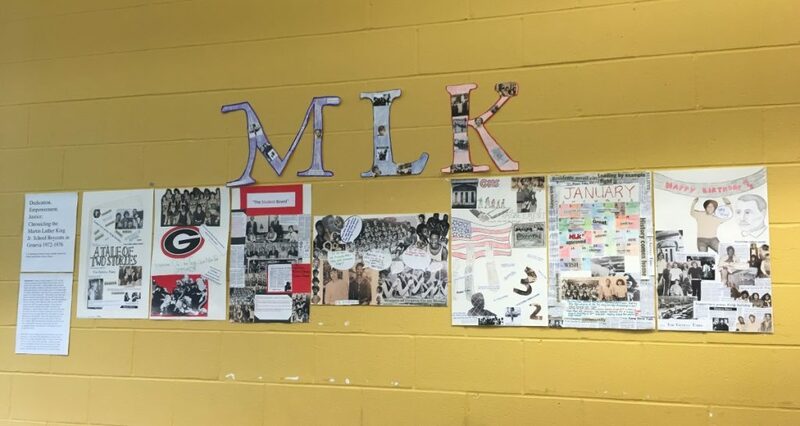 Based on student feedback, the project did help students recognize the significance of local history and that they too could play a role in improving their community. 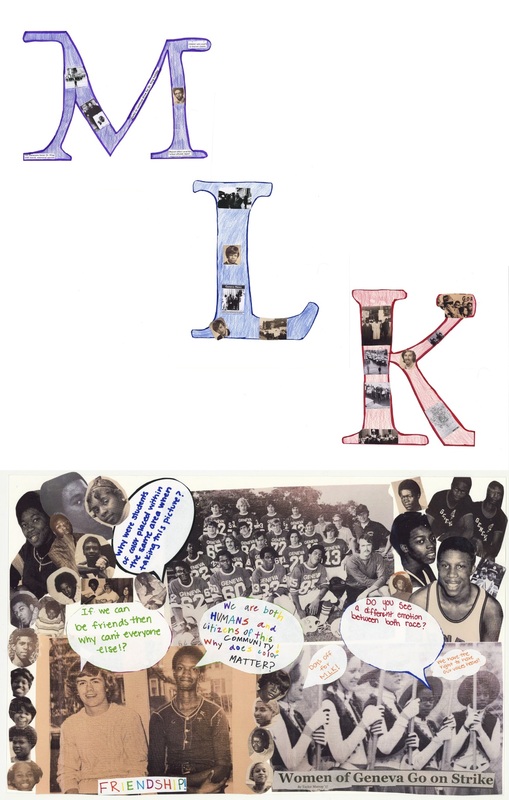 The mural was created as an illustration of students’ responses to these issues. 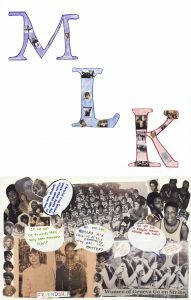 It incorporates excerpts from historical accounts, oral histories, and yearbook and newspaper photos from the years of the boycott. 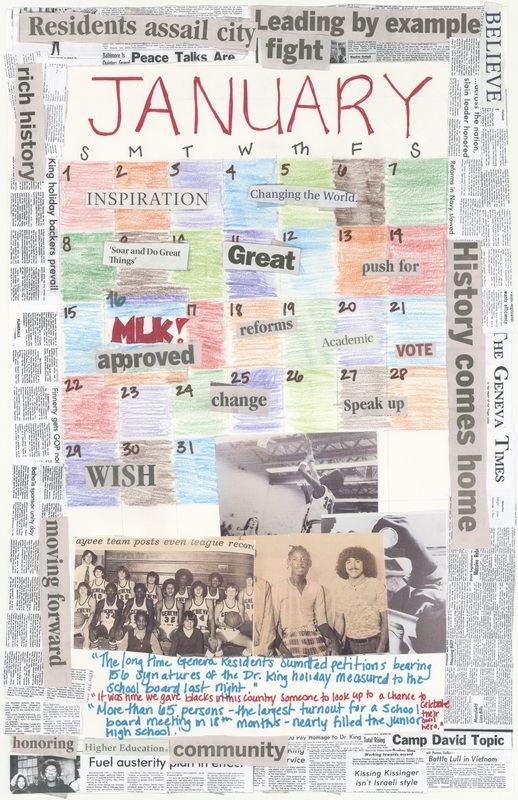 The People’s History of Geneva K-12 Curriculum project will continue this month with a second community workshop. This will be followed by two days for development of curriculum materials connected to local history using the oral histories collected by the People’s History of Geneva and material from the Geneva Historical Society collections. The 2017 workshops are funded by the American Studies Association and the Wyckoff Family Foundation. For more information about this project contact Anne Dealy at the Historical Society at 315-789-5151. To discuss contributing an oral history to the People’s History of Geneva, contact Elizabeth Belanger at belanger@hws.edu.